History: 65 year old male with shortness of breath. 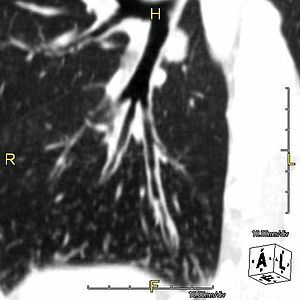 Bronchiectasis: Axial CT of the chest shows dilatation of the right upper lobe anterior segmental bronchus with bronchial wall thickening. Centrilobular and paraseptal emphysema are present as well. This is the appearance of bronchiectasis. Bronchiectasis is defined as abnormal widening or dilatation of the airways. It can be diagnosed by a bronchoarterial ratio (B/A) of greater than 1.5. Other ways to diagnose bronchiectasis include lack of bronchial tapering after airway bifurcations and visualization of the airways within 1 cm of the costal pleura. Bronchiectasis has many forms, including cylindrical with uniform dilatation, saccular which typically appears as a “cluster of grapes”, varicose (seen in the image above), and cystic (seen in the image below). 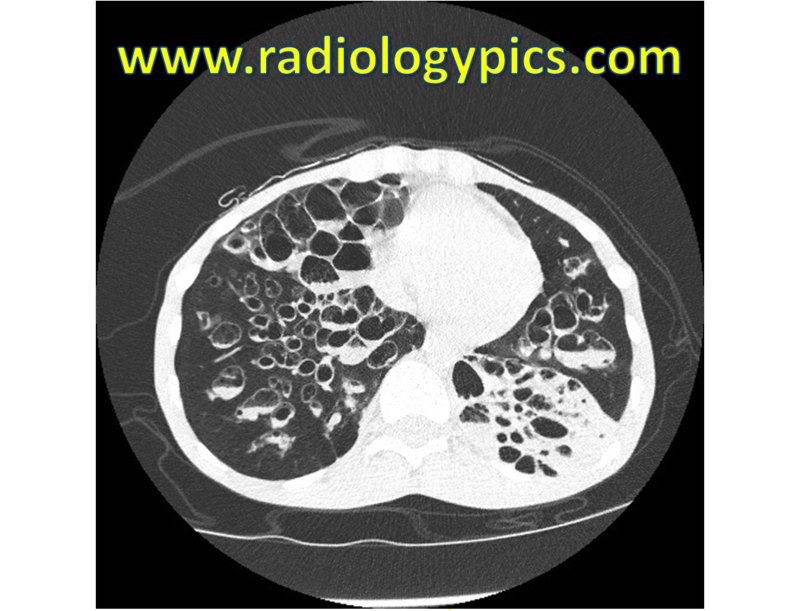 Cystic Bronchiectasis – Axial CT of the chest in lung windows reveals diffuse severe cystic bronchiectasis with air-fluid levels within the bronhci. Additionally, there is left lower lobe consolidation. 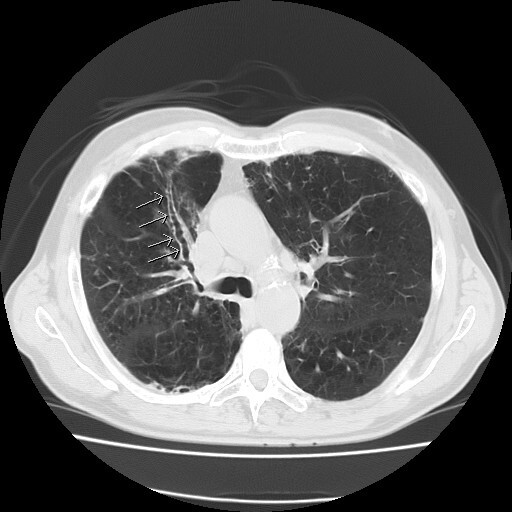 The differential diagnosis of bronchiectasis includes post-infectious etiologies such as mycobacterium tuberculosis, mycobacterial avium complex, Swyer-James syndrome, and aspiration, as well as post-obstructive causes such as endobronchial tumors and foreign bodies, traction bronchiectasis seen in interstitial lung disease, cystic fibrosis, asthma, allergic bronchopulmonary aspergillosis, and immotile cilia syndrome (Kartagener syndrome).